Still on the feasible side of promises and resolutions, I’ve been trying to make more yeasted recipes – because I always tell people I love working with yeast but taking a look at my blog that doesn’t sound very true. I got this recipe here – the same magazine these buns came from – and highly recommend it: the doughnuts are tender, taste great and imho don’t necessarily need the chocolate filling. Combine yeast, buttermilk, sugar and ¼ cup (60ml) warm water in the bowl of an electric mixer and stand for 10 minutes or until foamy. Add flour, butter, eggs and a pinch of salt and mix using dough hook attachment. Turn onto a floured surface and knead until smooth – I used the mixer for the whole process. Form the dough into a ball and place in a lightly oiled bowl, turning to coat, cover with plastic wrap and stand for 1 hour or until doubled in size. Turn dough onto a lightly floured surface and roll to 3mm thick. Using a 7.5cm (3in) round cutter dipped in flour, cut out rounds, re-roll dough and repeat. Divide milk chocolate among half the rounds, placing in center, brush edges with milk and top with remaining rounds. Using a 6.5cm (2 ½in) round cutter dipped in flour, trim rounds, pressing to seal. Place 2.5cm (1in) apart on a lightly floured tray and stand for 30 minutes or until doubled in size. Heat oil in a large deep saucepan or deep-fryer to 160°C/320°F. 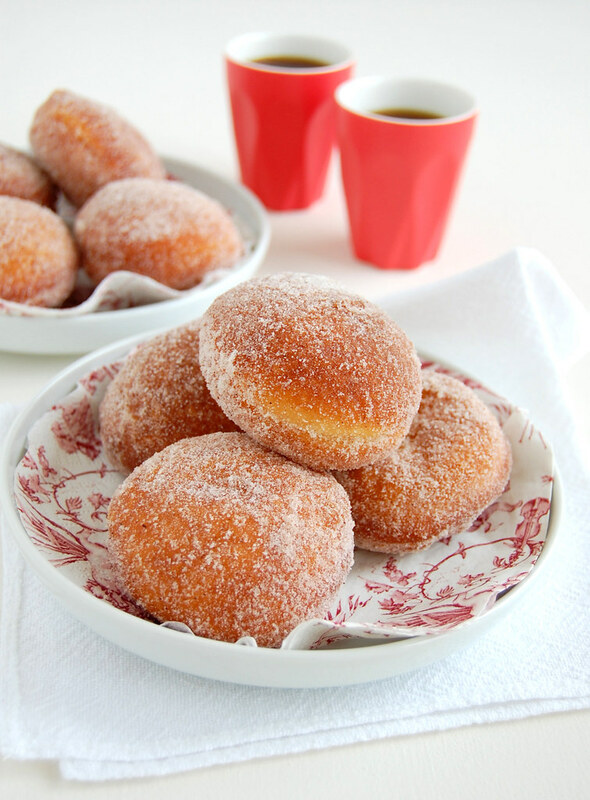 Deep-fry doughnuts, in batches, turning occasionally for 2-3 minutes, or until puffed and golden. Place over paper towels to absorb excess oil. Roll in cinnamon sugar and serve immediately. Oh yummy, I am going to gain weight reading your blog. I would love to try these - can any of the steps be done the night before? WOW!! These look really good!! They look light, fluffy, and have a great golden brown color! These look so soft and filled with chocolate - they must be heavenly! I was just thinking today that a doughnut sounds good, and then I see these! I think I need them now! I adore your little espresso cups in the background. These are nice and very tempting donuts! I can't wait to try it! Doughnuts are my all time favourite indulgence in lofe. Soft, light, fluffy, and delicous. But oh so bad for you..... These look perfect. Oh my goodness- this is my weakness. Donuts! These flavors look wonderful! These are giving me a serious case of food jealousy. Sarah, not sure... Maybe you should try one of those doughs that stay in the fridge overnight. Shirley, thank you for stopping by! Joudie, thank you for visiting! beautiful doughnuts, I could eat whole plate by myself....wish I could just grab them off the screen, right now!!! What perfect little doughnuts! I love how they're covered in sugar. May I know what is buttermilk? Can I use any milk for this receipe? M., thank you! I wish I could have shared these with you, sweetie! Terence, you should google "buttermilk". I would choose whole milk, always. These are just some of the most beautiful looking doughnuts I've ever seen. Not to mention that they sound divine. Perhaps I've just found my weekend project! Thanks for sharing. Just found your blog and suddenly i hv so many additional "things to bake" list :) i made ur toblerone recipe yesteredy and they turn out the most delicious cookie i've ever eat and hubby love it so much.. So thank u. Btw,pls advice if i would like to bake half recipe like u did, how i reduce the eggs? In this recipe, need 3 eggs ? And how about bajing time ? Do we need to change it as well ? Dear Grace, I'm so glad to know you're enjoying the blog! Thank you! When I need to use 1/2 egg, as per in this recipe, I do the following: I crack the egg in a small bowl and lightly beat it with a fork, then pour half the amount in the recipe. Baking times sometimes need adjust, I keep an eye on the oven so I can see if the baked good has risen and colored enough, etc.